Chinese students returning to the University of Melbourne last week were shocked at the posters plastered across their school campus: "Attention! No Chinese are allowed within this area. If intrusion occurs, deportation will likely happen." Similar messages were also found at another Melbourne-based university. The anti-Chinese posters were likely the product of a local white suprematist group which honors Hitler and the Nazis and is against the Jewish people as well as other non-white foreigners, including Chinese people. Young Chinese students are obviously deeply disturbed by the message. Still they may manage to dismiss it as a prank by a bunch of extremists and continue to focus on their studies. What's really disturbing is the fertile soil that cultivates and generates such anti-Chinese sentiment in Australia. Similar to the history of maltreatment of Chinese in the time of the Gold Rush and White Australian eras, present-day Australian policymaking seems to be straitjacketed in a narrow anti-China ideology, which partly results from the decades-long Cold War. What attracts attention, in particular, has been the conspicuous efforts by the Australian government to provoke China since US President Donald Trump came to power early this year. Following the scrapping of the Trans-Pacific Partnership (TPP) trade deal by Trump, there's confusion and disappointment among US allies in the Asia-Pacific region like Australia over the isolationist and protectionist tendency in the White House. Concerned with talk of a foreign policy more independent of the US in Canberra, a number of US representatives visited Australia to buttress the alliance system. In an effort to ensure Australia remains in the US orbit, James Clapper, former US director of national intelligence, targeted the Australia-China relationship in his speech to the Australian National Press Club. He said, "It is no secret that China is very active in intelligence activities directed against Australia, and is increasingly aggressive in attempting to gain influence in your political processes." On the triangular relationship among China, US and Australia, he concluded his speech by quoting former Australian defense secretary Dennis Richardson, saying "Friends with both, allies with one." Taking its cue from Washington, Australian Prime Minister Malcolm Turnbull, despite being humiliated by Trump, demonstrated his masculinity by attacking Beijing at the Shangri-la Dialogue in Singapore in June. In probably the most anti-Chinese speech at the conference, Turnbull spoke of "a coercive China" and threatened to "look to counterweight Beijing's power by bolstering alliances and partnerships." More recently, there has been a hysterical media blitz about so-called Chinese infiltration into Australia politics. Accusing two businessmen with Chinese backgrounds of being involved in Australian money politics, the media replayed the old story with materials from Australia's spy agency. Somehow, they successfully created an atmosphere in which China seemed to be an arch enemy ready to take over Australia. In response, Geoff Raby, former Australian ambassador to Beijing, said, "For some time, the China threat chant has been building, reaching a crescendo with the recent ABC Four Corners program on China's alleged 'agents of influence' in Australia." In a signed article, he criticized the lack of balance in Australia media coverage. "I was interviewed for 50 minutes by Four Corners, of which less than two minutes went to air." There's asymmetry in the nature of the China-Australia relationship in addition to their size in GDP and population. Compared to the anti-China sentiment in Australia running deep and long, Chinese people tend to view Australia as an ideal destination for study, immigration and tourism, with little knowledge of Australia joining every US war since WWII. Today's Australia owes much of its economic success to the growing Chinese market for Australian products as well as minerals. Yet its ruling class seems uncomfortable with ever closer trade ties with China. Australians sometimes fight harder than the Americans in order to maintain US predominance in the Asia-Pacific region, even at the expense of relations with China. The binary mentality was described by former Australian prime minister Tony Abbot as "fear and greed." The anti-China sentiment ran so high that Turnbull could casually referred to China as a "frenemy" and scholars calling for more nuanced discussion risk being labeled as panda huggers. Australian historian Robert Macklin says, "You don't get over 90 years of being told that the yellow hordes are coming and that White Australia is somehow an appropriate way to conduct ourselves, quickly." His remarks offer the best explanation of why Chinese students are singled out and threatened. 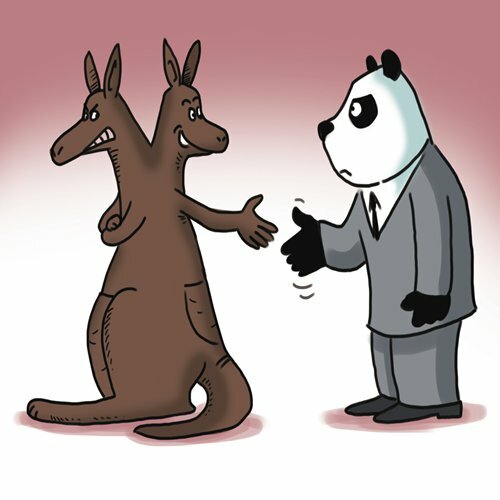 If Australia fails to tackle its anti-China sentiment, their own interests will be hurt, because China needs Australia much less than Australia needs China. Frankly speaking, Australia's image in China, which used to be friendly and innocent, is already undergoing changes in a different direction. A senior US military official said recently that he would launch a nuclear strike against China if Trump ordered it. Would Australia join the nuclear war? Given the unstable state of US politics, there's an added urgency for Australia to engage in serious discussion of its China policy.